Hussnan Ejaz, ophthalmic director at Specsavers’ Dudley and Blackheath stores, explains how persistence and participation in local health care schemes are paying off. 2018 was a great year for EOS in Dudley. The town’s new minor eye conditions service (MECS) scheme was launched in September, with around 30 local optical practices participating. The contract from Dudley Clinical Commissioning Group also commissioned cataract pre-operative assessments and glaucoma referral refinement. Dudley is on a roll. Since March 2018, the Specsavers opticians practice has been part of the Healthy Living Optical Practice (HLOP) scheme, which aims to improve accessibility to essential NHS services. Four employees completed training in order to administer the free services, which include help with smoking cessation, alcohol screening and NHS health checks. The store also built a new easily-accessible, soundproof room to use as a health clinic. The clinic is available seven days a week and accepts walk-in patients as well as referrals from GPs and internal referrals. It’s been a game-changer for Dudley. I think it’s just going to continue to grow and be a massive success. According to the chair of Dudley Local Optical Committee (LOC), Shamina Asif, the new schemes were commissioned following the success of the HLOP scheme, as the CCG saw the potential in optical practices. Dudley LOC had persistent meetings with the CCG and secondary care, demonstrating the success of extended primary care services in neighbouring areas such as Walsall and Wolverhampton. With MECS services already in place in neighbouring areas, the new Dudley contract means that patients across almost all of the West Midlands will be able to use optical practices as their first port of call for minor eye problems. In the first six weeks we saw 77 patients just on MECS. That’s 77 patients who would have potentially been seen at the hospital or GP surgery. The Dudley team were able to hit the ground running when the new schemes launched, as all staff had already received appropriate training. 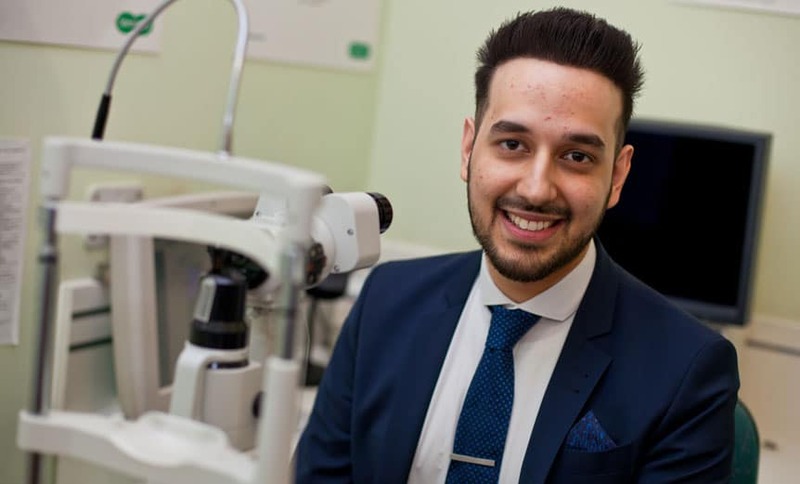 Hussnan says: ‘We’ve done a lot of training and developed both sides – the clinicians and the front of house from optical assistants to receptionists and telephonists. Gurdeep has helped to raise awareness among potential patients by visiting doctor and patient engagement groups, the charity Age UK, the Freshers’ Fayre at Dudley College, and even a local WI (Women’s Institute) group. The Primary Eyecare Company has delivered leaflets and posters to all GP surgeries in the Dudley CCG area, and the schemes are promoted in store with POS (point of sale display products). The staff are on board, too, telling optical patients about the NHS schemes, and talking to health clinic patients about eye tests. Have the correct facilities and systems in place in order to maximise the opportunity. Offer plenty of appointments and make sure there’s enough availability. We have dedicated clinics for EOS. Just get on board! EOS is great for GPs and pharmacies and it’s great for patients. It’s providing more all-round healthcare.